-Kimberly Ngugi is co-owner & manager of Music Kids Daycare at the River Market, a new flexible music daycare by Music Box. After completing her Early childhood education certificate and diploma specializing in infant/toddler and special needs care, Kimberly has enjoyed many years of experience teaching children in a variety of settings from daycare, junior kindergarten and pre-school internationally in Kenya. Kimberly is passionate in creating environments for children to make meaning of the world on their own with room to create, imagine and discover. She also has special education in teaching English as a second language and music. She lives in New Westminster with her husband and 1 year old son. All children learn, discover and understand in different ways. The way in which one child will understand why leaves are green during summer and fall in autumn, may be completely opposite from another. Being aware that every child learns differently and providing them an atmosphere and environment to explore and make their own theories about life seems crucial to me. Below is a poem by Loris Malaguzzi, founder of the Reggio approach. A poem that was shared with me in college when studying early childhood education. It completely changed my perspective on children and the environments which they should be surrounded by to make meaning of the world around them. After working in child care for many years and seeing the endless amount of plastic toys the children had to play with, it made me wonder if play was universal. Could children living in the uttermost poor and rural environments still play like children exposed to plastic toys and IPad’s? 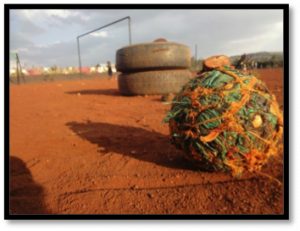 The idea of children living in a slum with mud walls to form a simple home and walking in streets of debris seemed to shout a loud, “NO!” Surely children do not play all over the world. But as I walked through the slums of Kenya interacting with the children there, my opinion began to change. I found children making use of other’s garbage to create toys. I remember one young girl crouched on the ground biting her lip as she put all her concentration and efforts into tying a filthy string to a polythene bag that had been thrown out. I crouched next to her and asked what she was making. Sure enough, as she finished attaching strings to each side of the bag and a breeze passed by, the kite lifted into the air. With a cheerful giggle, the girl stood up and raced around with her kite. My son & I taking a moment to explore on one of our walks. My one-year-old son reminds me of these children every day. Like most of you, I’m sure, we have a toy box in our living room. It’s full of plastic toys, as I like to call them. Rarely do I find him playing with a single toy in it. Instead he is eager to play with wooden spoons or to open every cupboard in the kitchen and discover a toy box of pots, pans and Tupperware’s. When we go to the park, I pack the diaper bag full of toys and every time I fail to unpack even one of them as he much prefers to play with the leaves, sticks and rocks. I’m sure many of you can identify. Real. Authentic. Natural. My son will choose a real adult-like spoon over his small plastic spoon. 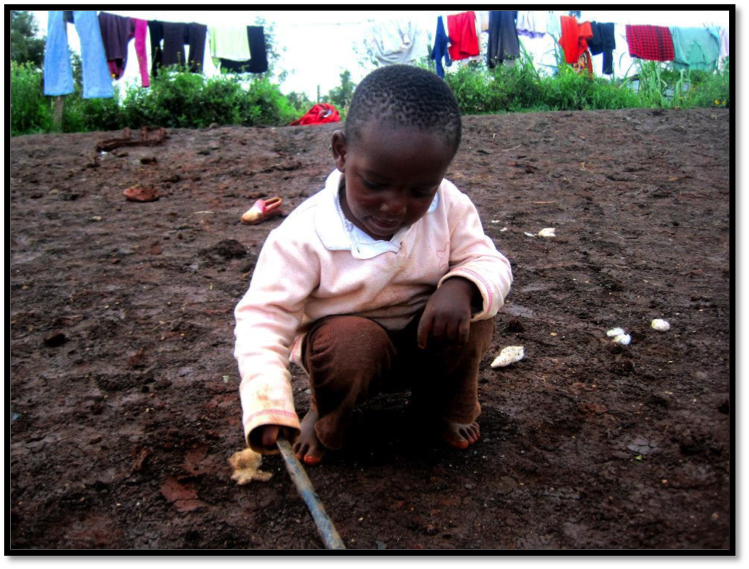 He will choose to play with a stick over a plastic car. He prefers to watch real fish in a pond than play with his plastic fish that flash and play music. Do all children play? I’ve determined whether children are exposed to manufactured toys or left to imagine what they can create with the natural items around them, it is an outstanding YES. 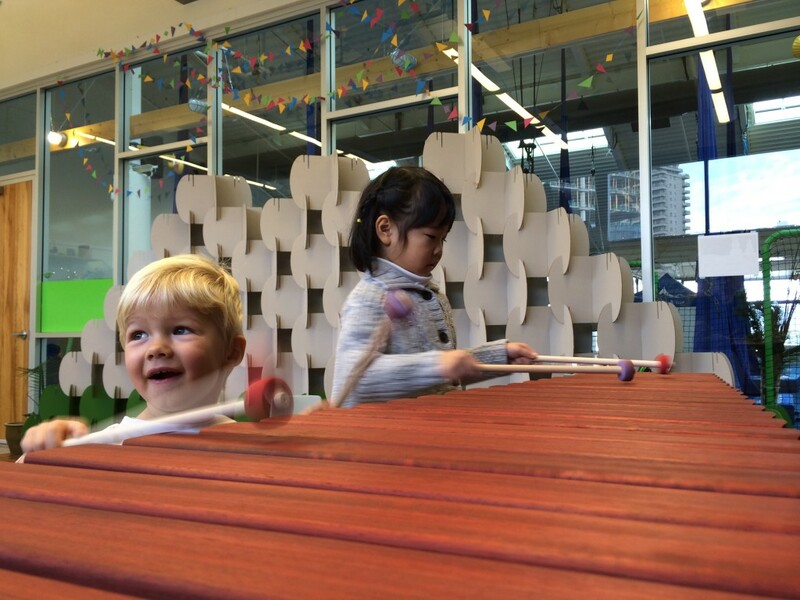 After working with children for many years and studying the way they play and learn, I couldn’t be more excited to have just opened Music Kids Daycare at the river market by the New Westminster Quay. Founded with Reggio Emilia philosophies from Italy, children are exposed to real, authentic, natural items. I believe every child is competent and should be treated so. 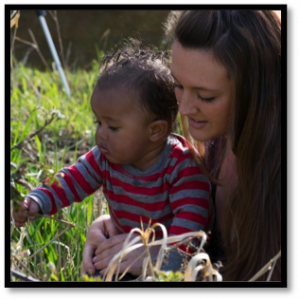 Every child discovers and understands differently from another and I truly desire to provide an environment that allows a child to make meaning of the world in their own way. Do all children play? Even in the uttermost poor and rural environments? I have no other word to answer with but “yes.” Let’s replace the plastic with natural, the manufactured with authentic and provide our children with an atmosphere that encourages creativity, imagination and understanding. Clinton, age 3, discovering that he can still draw a picture in the dirt with a stick even though he lacks paper and felts. Q. What about my 3 year old? A. Everyone believes their 3 year old is a genius (mine certainly is 🙂 There are always exceptions of course, but generally private music instrument lessons are best waited until recommended ages found in my Parent Guide. However, most music teachers are happy to give a short assessment of your child and will give recommendations for appropriate instruments and how much longer (if needed) to wait before starting on an instrument. Q. What are most teachers looking for in music instrument readiness (regardless of instrument)? A. Universal of all instruments; Recognition of letters A-G and basic numbers 1-4 (no need to be writing or reading yet, however writing is preferred to have begun), Left and Right hand distinction, a particular level of fine motor skills is expected depending on the instrument (can they touch each of their fingers individually to the thumb? do up a button? ), ability to listen, respond and follow instruction, genuine interest in music (do they like to sing or dance?). Q. How do you know if it is the right instrument? A. Please see our Parents Guide. Generally if they meet the minimum age, show an interest and meet any physical requirements they are good to begin. To note: Sometimes, the minimum recommended age is still too young for the particular child (could be for any number of reasons such as maturity, behaviour, physical size, etc). If you are curious if it is a good time for your child but are not sure, it never hurts to get a professional music teacher to assess them and give their opinion. Q. My child has been told to wait to start private music study – what should we do in the meantime? A. Parent led singing and musical activities at home are the number 1 best thing. Sing, sing, sing, dance and play music of all kinds in the house, oh and sing. Having small musical instruments around the house mixed in with their toys – egg shakers, maracas, keyboards, xylophones, recorders, drums and more encourage your son or daughter to make up songs as a play activity or jam along with the radio – aiding natural rhythmic and melodic development in a fun way. General Group Music Lessons are also instrumental in preparing children for school readiness – learning to be a part of a group, following direction and more. There are many different systems for Group Music Lessons, Suzuki, Kodaly, Kindermusik, Music Together, to name a few. We love our Music Kids Club – it is a perfect bridge to instrument learning and a wonderful supplement music program for those entering or in preschool or kindergarten. Q. My child has a disability, can they still take lessons? A. Yes, most definitely. Music teachers (speaking at least of our studio) are generally familiar with working with children of different abilities, will often have special training or experience with different abilities such as blindness, autism, arthritis, speech impediments, hearing loss, MS, and more. Music training can be both therapeutic and highly successful with people of any ability, creating wonderful musicians, performers and teachers. Q. What about group instrument lessons? Q. My son is 6 and wants to learn piano but I still don’t think he’s ready for lessons yet. Should I still put him in? A. No. Wait until you think he is ready. Parents know best, if you have reason to believe he wouldn’t do as well now as in a year or 6 months, there is no need to rush it. A. No, not at all. Do not worry – starting piano at 7 instead of 4, or 30 instead of 4, or 74 instead of 4, is not a problem. The most important factor to success in music is starting and persisting, regardless of age. Why consider some instruments at an earlier age over others? How does one assess if it is the right instrument? Piano is the generally the most popular and successful instrument to start with from a young age. Most children can successfully begin at age 4 (this was me many years ago!) or 5. Occasionally, some children can begin as young as age 3.5 (lessons for ages 3-5 year olds generally incorporate a number of off the piano activities to reinforce piano skills in new and interesting ways. Instruments, colouring and movement may be incorporated depending on the teacher and needs of student). Skills to have mastered; Left/Right hands, recognize letters A-G (no need to be reading yet though), strong fingers with a high level of finger independence (how would you evaluate their fine motor skills? can they do up a button or zipper yet?). Piano is a great foundation for all instrument study, music reading is transferable to any instrument, the finger strength, rhythm and theory skills that piano study builds alone are irreplaceable. 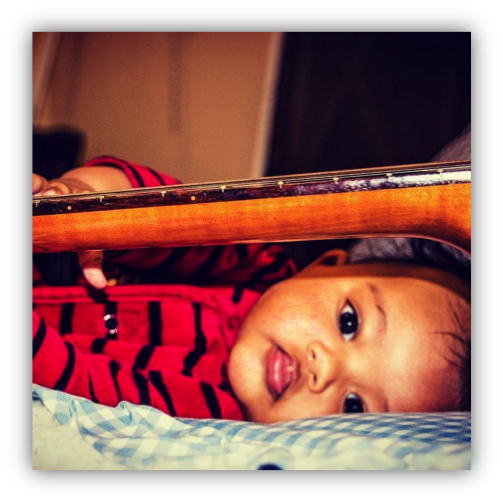 Guitar is a great instrument to begin at age 6 or 7, (to note for petite children – only with the right sized guitar – please speak to an instructor about the best size for your sized child). At this age it is best to start on an acoustic guitar with nylon strings, then transitioning into steel strings or electric guitar if desired. Children must have strong fingers (much stronger than Ukulele to fret the notes) and be comfortable with developing calluses. Flute is a wonderful great first wind instrument, best started at age 8. Children need time to develop lung capacity and grow their little bodies (holding instruments away from your body for extended periods of time is tiring!) so no earlier is recommended. A wonderful precursor to the flute or clarinet however is the Recorder, which is great to begin at age 6. The Violin can be very successful at age 5 if the child shows an interest. Unlike the piano, the violin is not as initially gratifying to listen to 😉 However, this beautiful instrument is great for developing a keen sense of pitch and heightened listening as one must be diligent on each sound made being in tune. Fine motor skills must be well developed here for a small fingerboard, good wrist flexibility for careful bowing and acknowledgment that sometimes arms will get tired from holding the instrument. Thankfully violins come in a large assortment of sizes, all the way down to 1/16th of the original size, be sure your child is fitted properly and always playing the correct size. The violin is also a great precursor to the cello, which is best started at age 8 or 9. Voice lessons are best started at age 8. Much like the Flute and Clarinet, time is needed to develop lung capacity and grow! However, lessons can sometimes be started as early as 6 years old with the right teacher who takes care to guide the voice gently with repertoire and technique that is age, voice maturity and range appropriate. Voice training has many benefits, but less known to point out are – aiding in speech impediments, lisps, dealing with a new retainer or braces and finding a full voice for speech. To note – voice lessons are a wonderful compliment to piano or guitar learning where one can eventually learn to accompany themselves while singing and can provide a sound theoretical base for the voice. Private drum lessons at age 8 are great if there is strong interest shown. Aptitude for rhythm can be indicated very early on in life (perhaps a gift of a toy drum they love to sing and play with?) and generally speaking you may be able to tell if your child is naturally rhythmic much earlier than 8 years old. Things to look for – strong coordination, beating beats on the kitchen table, love of dance, can clap (or tap, or beat on the table, etc) a steady beat, can clap back accurately what you clap, can clap along in time with music. However, the beauty of music training is – these things we look for to see if there is a natural tonal or rhythmic ability with any instrument – can all be developed with desire & study! Hooray! A recent study by Kimberly Schonert-Reichl and Kristin Layous from the University of British Columbia and the University of California, Riverside, entitled, “Kindness Counts: Prompting Prosocial Behavior in Preadolescence Boosts Peer Acceptance and Well-Being”, surveyed 400 Vancouver students between the ages of 9 and 11 years old. The students were asked to report on their happiness and identify which of their classmates they would like to work on activities with. Following the initial survey, the students were divided into two groups and had four weeks in which they were randomly assigned to another task by the researchers. The results indicated that although both groups felt that they were happier overall, the children who were asked to perform acts of kindness chose higher numbers of classmates to work on activities with, than the group that was asked to make note of pleasant places they visited during this time. Have you checked out Tumblebooks ebooks and Tumble Readables for kids? Now available from the New West Public Library for download to your iPad. Being able to focus, hold and work with information in mind, filter distractions, and switch gears is like having a sophisticated air traffic control system to manage information at a busy airport. Harvard University’s Center on the Developping Child offers this two-page summary—part of the InBrief series—which outlines how these lifelong skills develop, what can disrupt their development, and how supporting them pays off in school and life. Also see this this new online training module , develloped so that early care and learning professionals can better understand and support the development of executive function skills.